"As posted on Facebook" (see event link to let us know you're in!) and stay tuned for more details as outlined below! Similar to last year's event, but easier to join in and even more opportunities to participate in our "Recycling, Upcycling and Exchange" showcase! See last year's highlights at www.southcowichanrotary.org under Featured Projects and Events, and contact the event coordinator Kim to get on board! Safety Tips: Plan on sturdy footwear and long pants, and dress for the weather (ie hat and sunscreen) You'll also want to bring a refillable water bottle! *Rotary Event Marshals will assist you to complete an Event Waiver for all volunteers (please note: Participants ages 12-17 must have a parent/guardian sign also, and we recommend they work the roadsides together, while families with children under 12 can choose to work the non-roadside park areas) Let us know if you are okay to be included in any photos being taken of our event in progress! 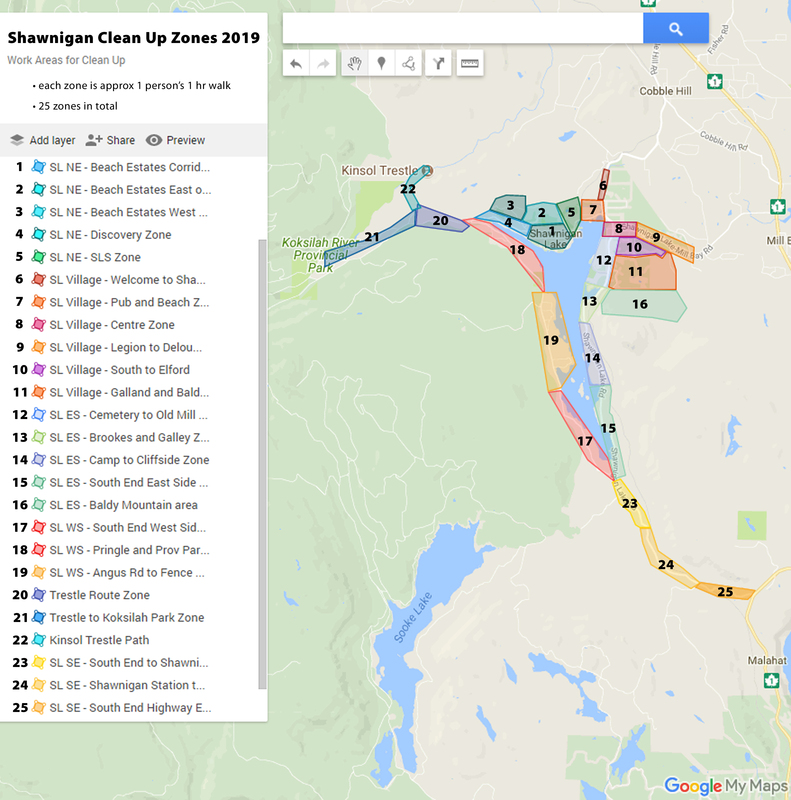 Locals and (invited) volunteers from the Shawnigan Residents Association can assist you in where to choose, based on our event day coverage! Thank you to Coast Waste Management Association for lending us their hi vis vests for our event! Refundables can be sorted onsite if you'd like to bring them back with you as donations! Thank you to our hardworking industry partners for their support! Stay tuned for stats on how much was collected! RETURN to CHECKOUT with your gear and your stories! We would love your feedback based on your experience helping today - be sure to talk with one of our Rotary Club members or write in the Event Notebook! Use our PHOTO BOOTH to create your Social Media "Action for Clean Up!" Thank you to our Rotary Club sponsors and EcoDrone Solutions for photo/video recordings of our efforts! ENJOY refreshments available onsite for our volunteers, with thanks to our suppliers and the support of the CVRD and Mosaic Forest Management! LEARN and ask questions of our knowledgeable community service organizations, environmental stewards, and industry professionals with educational resources on hand for local recycling and waste diversion strategies! Be sure to check out the displays! This year we will be joined by booths with information from Fisher Rd Recycling and P.A.N. Disposal, Recycle BC, the CVRD, the Shawnigan Residents Association and the Shawnigan Basin Society! Thank you to all of our participating industry partners, schools and community groups! Special thanks also to Signology Signs & Graphics, Falcon Crest Imaging, London Drugs and The Cowichan Press for our wayfinding, branding and printed materials! PLAY in KIDZONE with "facepainting by Alexandra" and family-friendly fun activities like Earth Balls, bubbles, sidewalk chalk, upcycling crafts, pick-up games and more! Thank you to our creative sponsors and student volunteers! There may be EASTER EGGS with redeemable prizes to find out there - stay tuned! New this year... we hope to offer MUSIC, to welcome a visit by the Juice 89.7 FM Community Cruiser, to have a Canadian Diabetes Association CLOTHING/TEXTILES drop off at the Pavilion, and a local *AVEC*TRASH UPCYCLED ART exhibit! We also have a KAYAK group that will be specially equipped to snag litter on the water near the beaches and shoreline!! Stay tuned and let us know if you can assist in these areas! Thank you to all of our Clean Up Volunteers who are our HEROES - especially today! Collective efforts DO make a difference! Just as thrift shops were inundated with people’s unwanted clutter as a result of the Tidy Up “KonMari” effect started by Marie Kondo, so we too can begin to see unwelcome litter as our opportunity to Tidy Up our community and load up our local disposal depot! Have you heard of the #Trashtag Challenge? The idea is to take a photo of an area that is damaged by trash, carefully collect and bag up all of the mess, and celebrate your hard work on social media by sharing the “Before+After” photos using the hashtag #Trashtag. Locally, you can do the same and include the hashtag #ShawniganCleanUp2019 – and your work could be featured in our Event Gallery! 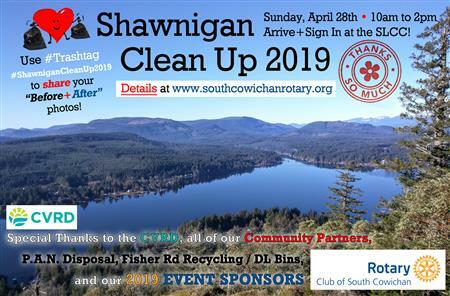 #ShawniganCleanUp2019 is Sunday, April 28th from 10am to 2pm, with a community-wide coordinated effort launched from the Shawnigan Lake Community Centre in the heart of our village. Volunteers will be dispatched to zones around the lake and along our high traffic areas, equipped with bags, gloves, and tongs and the means to gather and deal with all of the litter to be sorted and hauled away. Refreshments plus related activities and info will be shared. Plan to enjoy the benefits of many hearts working together to take care of our environment! This team effort is going forward through the South Cowichan Rotary Club in collaboration with Fisher Rd Recycling / DL Bins, P.A.N. Disposal, and Mainroad South Island Contracting - along with the community support of the Shawnigan Residents Association, Area B Director Sierra Acton, and the CVRD. Many thanks to our safety resource partners who will also be on hand! We will be involving interested groups, schools and businesses to sponsor and participate during the 4-hour event. More details will be available HERE at www.southcowichanrotary.org so stay tuned!